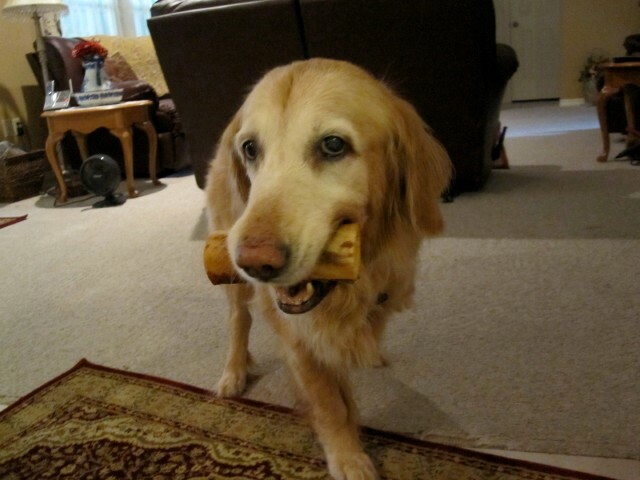 OSA is a malignant tumour of bone and it is the most common bone tumour found in dogs. It mostly affects the limbs (appendicular skeleton) but it can also develop in the skull, spine and the ribs (axial skeleton). The tumour occurs more often in the front legs, commonly affecting the bottom of the radius (wrist joint) or the top of the humerus. 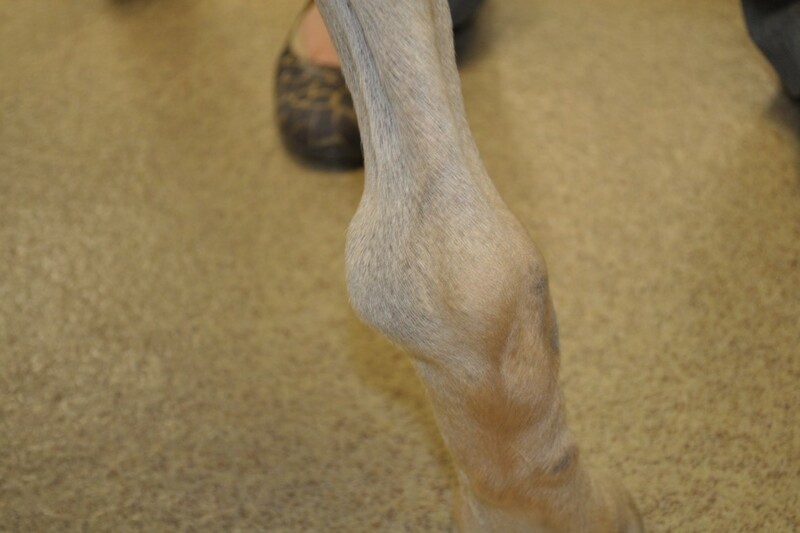 OSA can also occur in the femur and tibia of the hind limb. 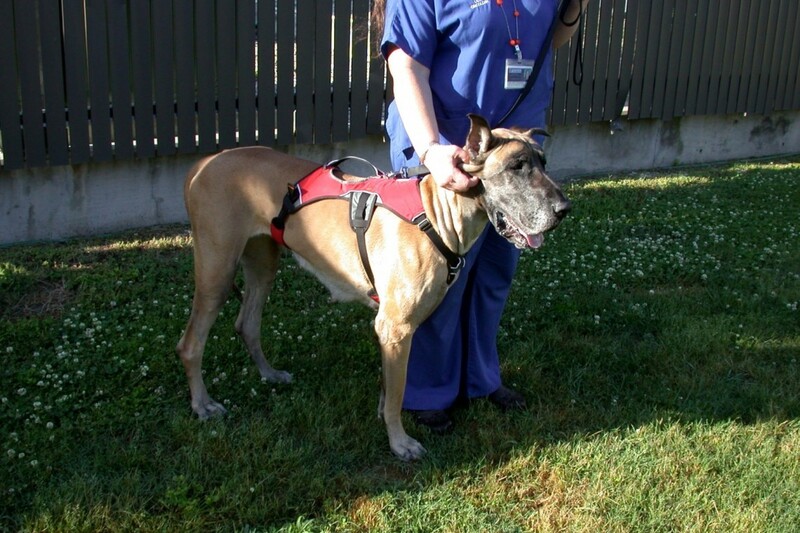 OSA can occur at any age and in any breed but it usually develops in older, large and giant breeds. How can I tell if my dog has an OSA? 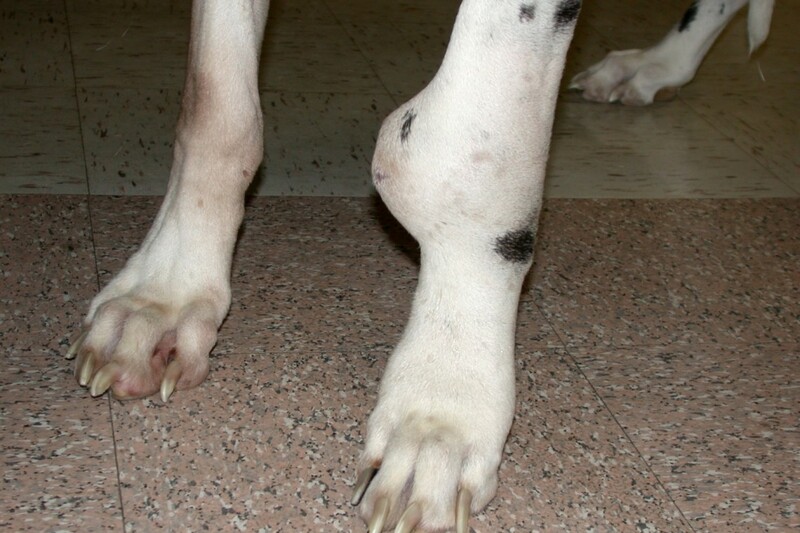 If OSA is affecting your dog’s leg you may or may not have noticed a local firm swelling in the limb. You may also, or only, have noticed that your dog has developed a lameness which is persistent and does not resolve with rest, and often painkillers. OSA is a painful condition, so they may also be showing signs of restlessness. However, some dogs are extremely brave and hide pain remarkably well, so they may only be exhibiting subtle behavioural changes, which you may only be able to identify, e.g. loss of appetite, shaking or shivering, change in demeanor and reduction in activity levels. Sometimes because of the changes the cancer causes in the bone architecture, it weakens the bone and it eventually fractures also known as a pathological fracture. OSA in the mouth may present as bad breath, seeing blood in the food or water bowl or a visible mass near the teeth or gums. If your pet has OSA of the skull bones, the tumour may cause changes in their facial appearance and symmetry, or grow into the brain cavity possibly causing seizures. Spinal OSA may compress the spinal cord or nerves and may cause your dog to have difficulty in walking, partially or even completely. Rib OSA can look like a firm fixed swelling beneath the skin over the rib cage, often about 2/3 rd way down the length of the rib. There is no definitive cause for OSA but it is thought to be related to the genes that both promote and suppress tumour cell growth. 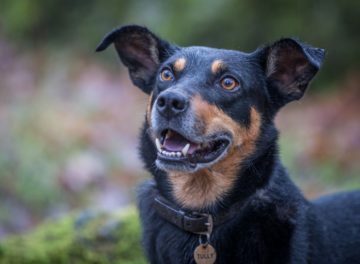 It is definitely seen in some breeds more than others, for example Greyhounds, Great Dane, Mastiffs, Irish Wolfhounds, Dobermanns and Rottweilers. Diagnosis aims to not only investigate the primary tumour but also determine the extent of the cancer within the body (staging) at the time of presentation. 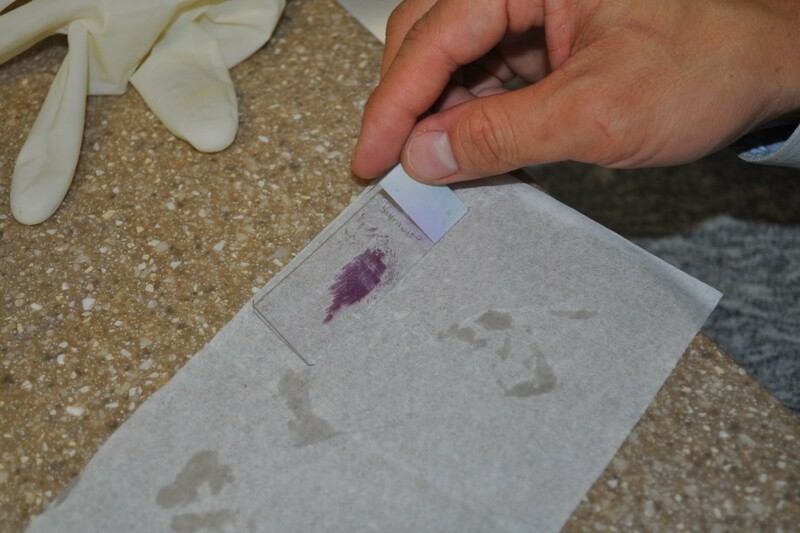 Taking blood and urine samples are routine procedures. It provides us with invaluable information regarding the general health of the patient, which in turn enables us to develop individual anaesthetic protocols as necessary. It may also provide us with information about the cancer itself. 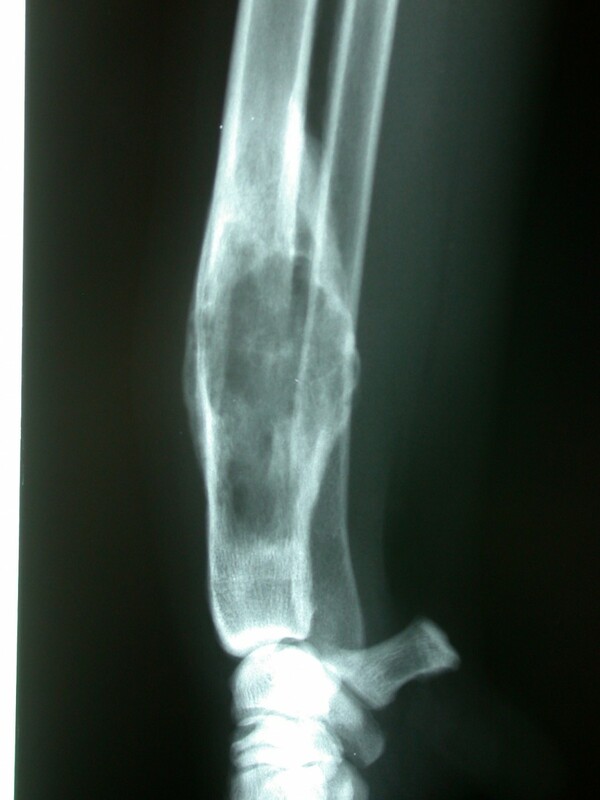 X-rays are taken of the affected leg to rule out any other problems, for example fracture or infection, and to ascertain the extent of the infiltration of the cancer in the bone and neighbouring joints. Secondly, x-rays can be used to determine the extent of tumour spread to other parts of the body, specifically the chest and lungs, which is the most common site of spread of OSA. CT takes virtual ‘slices’ through organs (so-called ‘cross-sectional’ imaging) and is a much more advanced imaging technique compared to x-rays, able to detect much more subtle changes in the bone and lung. CT can also be used to reconstruct the bone tumour in 3D to help your oncology clinician make decisions about whether or not it is possible to save the leg (‘limb-sparing’). Under sedation, a fine needle can be pushed through a thin defect in the bone wall to collect some cells which can be examined under the microscope to confirm the diagnosis of cancer. 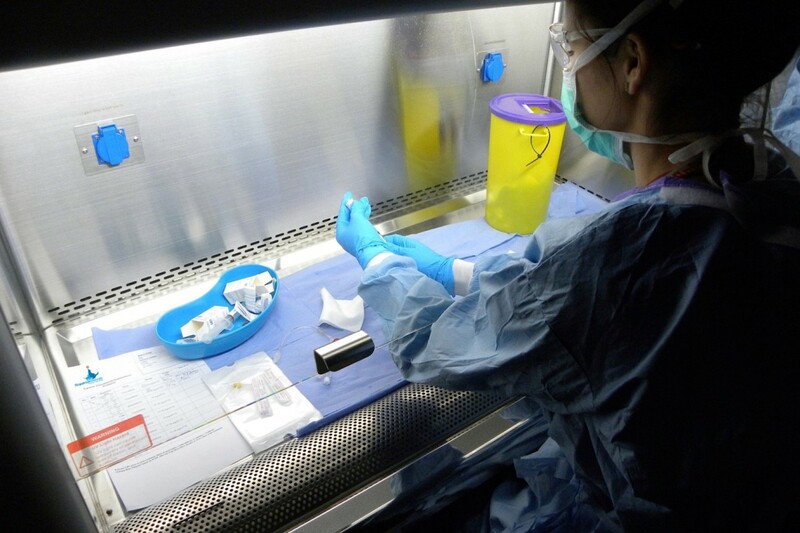 Sometimes insufficient material is obtained this way, and under general anaesthesia, thin cores of bone tissue are taken and examined under a microscope to confirm malignancy. It is not always necessary to biopsy bone lesions ahead of treatment but your oncology clinician will discuss this process with you. There is no ‘best’ way to treat bone cancer. Every path we choose depends on discussions with you and your family, ie the people who know the patient best. Somewhere below will be an option that is right for you, or it may be a combination of several different options. Our goal at Fitzpatrick Referrals Oncology and Soft Tissue Service is to demystify cancer care and put you back in control. We will be working with you every step of the way. It is important to realise that by the time we diagnose OSA, cancer cells have almost certainly already left the primary mass and have moved to somewhere else in the body (metastasised). These cells, in clusters or individually, are too small to find before surgery, even with the highest-definition CT scans. They often remain dormant for many months or years, and we use chemotherapy to try and slow the progression of these metastatic cells into detectable secondary tumours. These are bone-hardening drugs originally used in human medicine to strengthen weaker menopausal bone, but their use has evolved to treat bone pain, specifically cancer pain. The drugs are given intravenously, typically every 3-4 weeks. These can be used in conjunction with the home care protocol. Their use will reduce bone pain, decrease bone destruction and so likely decrease the risk of pathologic fracture. Radiation therapy, delivered by a linear accelerator, can be used to treat cancer-related bone pain. Depending on the protocol 1-4 doses (‘fractions’) might be given, in conjunction with home care and bisphosphonates. Radiation only targets the tumour in the bone and does not address the distant spread. 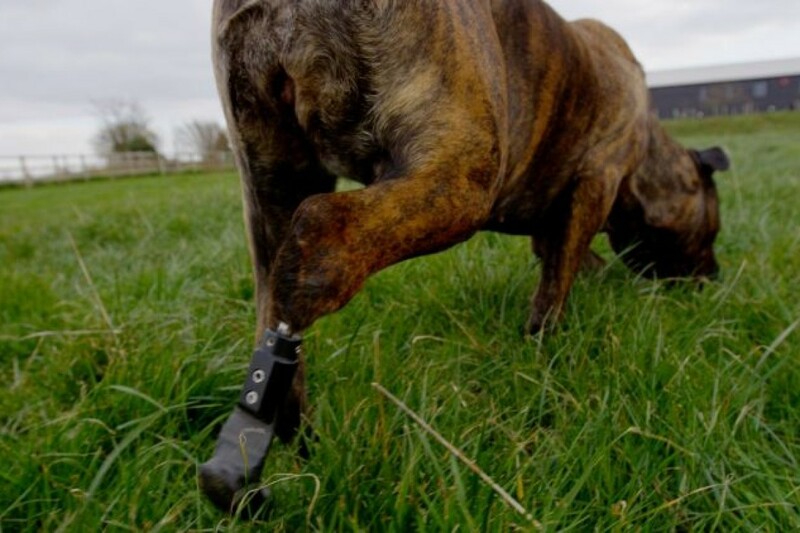 Amputation is well tolerated in most dogs, even when in the front legs of the giant breeds. When making the decision to sacrifice the limb, other factors such as concurrent orthopaedic and neurologic disease need to be considered. Sacrificing the affected limb is a common surgical procedure performed to remove the primary tumour, and is the fastest, most reliable and most predictable way to end bone pain, to minimise complications of the bone tumour, and to prevent the development of a pathological fracture. Limb sparing surgery describes any technique whereby the bone tumour is removed without removing the limb. Simple examples include removing part of the ulna (ulnectomy), or part of the scapula (scapulectomy) if the tumour is well confined to parts of these bones. 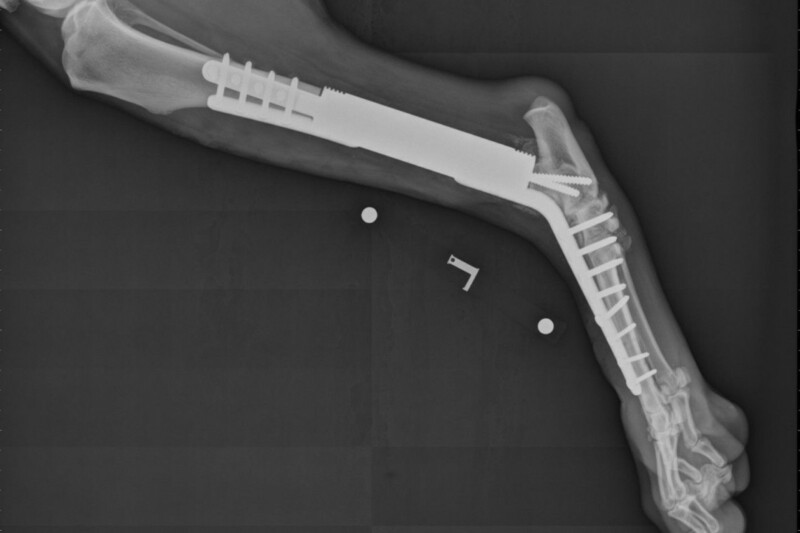 If the tumour is in the major long bones that bear most of the dog’s weight; for example the radius, humerus, femur or tibia, then implants need to be used to replace the missing bone defect. This might be an internal prosthesis, for example a metal construct filling the bone defect where the cancer bone was, and attached to the adjacent bones with screws; or an external prosthesis, typically directly anchored into a bone end and passing through a sealed skin corridor, with a rubber foot attached for walking such as our amputation prosthesis called a PerFiTS. Professor Noel Fitzpatrick developed this innovative amputation endoprosthesis, PerFiTS implant (Percutaneous Fixation To Skeleton), which is an innovative surgical technique only available at Fitzpatrick Referrals used to treat animals where the lower part of a limb is obliterated either by cancer (bone cancer or soft-tissue cancer), or by severe trauma to bones, muscles, nerves and/or blood vessels. 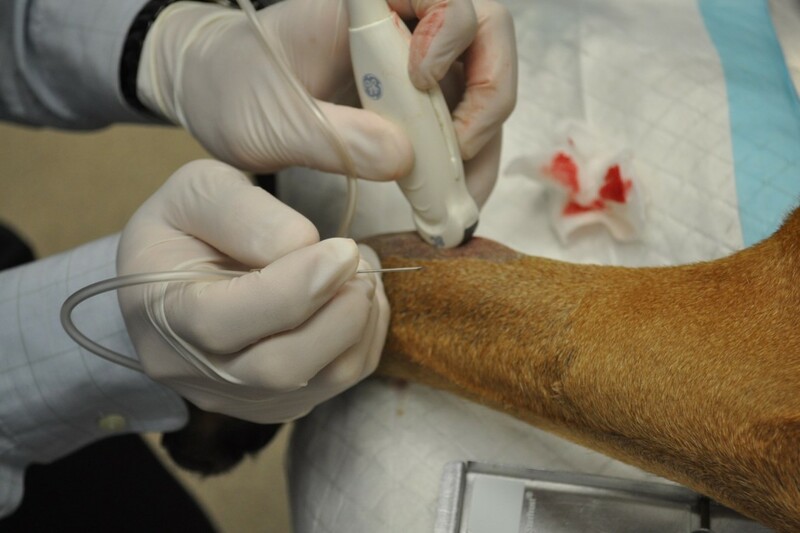 These techniques are specialised surgical procedures which are carefully tailored to the individual dog and family. 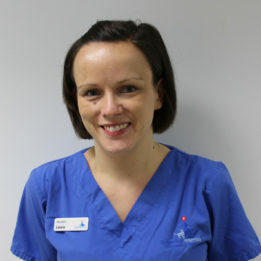 With collaboration between the orthopaedic surgeons and surgical oncologists at Fitzpatrick Referrals, no centre in the United Kingdom has more experience in surgical limb spare techniques and technology. 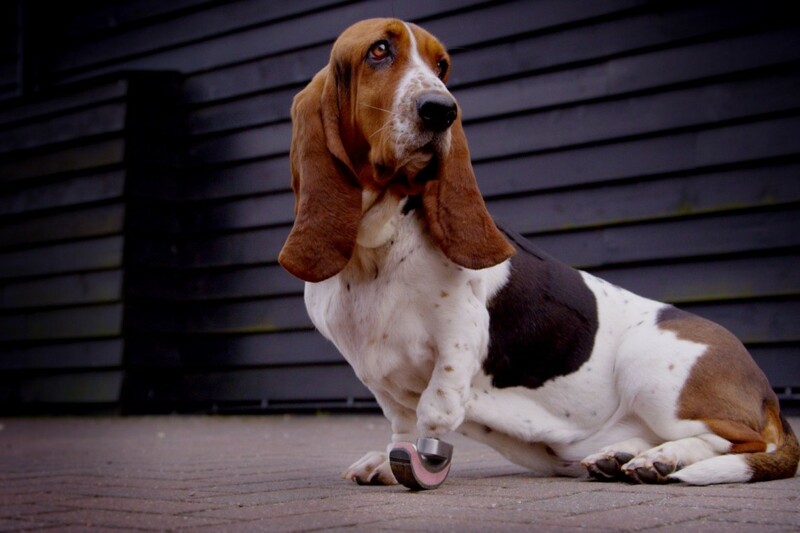 At Fitzpatrick Referrals we are able to provide radial endoprosthesis or tibial endoprosthesis for the front and hind limb respectively. 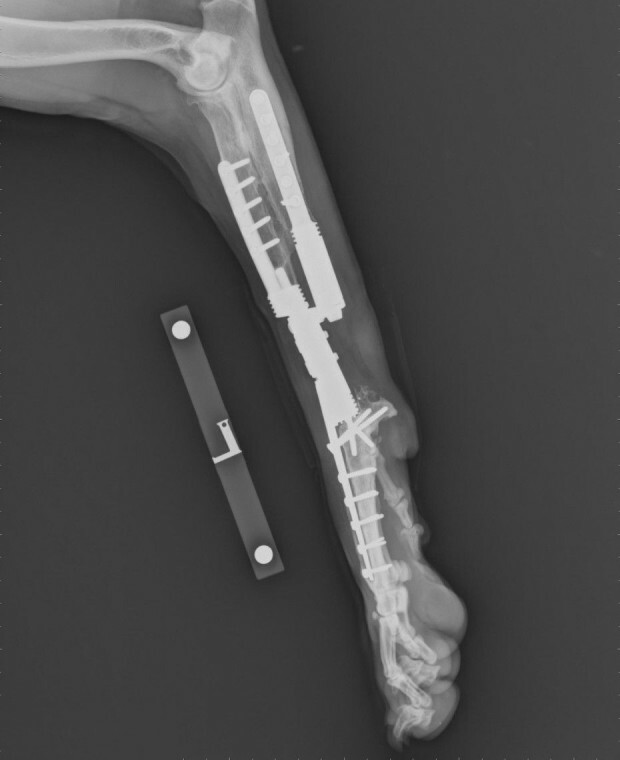 This is a technique that Professor Noel Fitzpatrick has devised as an option for the salvage of a limb with a long bone osteosarcoma. The number one goal of treating OSA is the relief of bone pain and the re-establishment of a good quality of life. 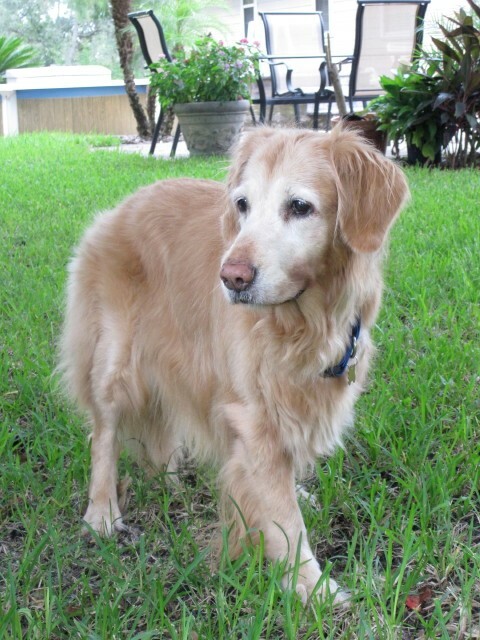 The second goal is longevity – we know for a fact that chemotherapy extends the life of dogs suffering from long bone OSA. The treatment regime we employ is typically an intravenous injection of chemotherapy drug every three weeks, most often a drug called carboplatin. We adhere to the strictest safety standards for reconstituting, delivering, and disposing of chemotherapy drugs and waste. Our oncology clinicians and oncology nurses have years of experience of chemotherapy for OSA and their goal is to make the patients and families as comfortable and educated about the process as possible. Dogs do not normally experience the same side-effects as people, although we do occasionally see transient inappetence, nausea, lethargy and loose stools. These often last just a day or so after treatments and improve on symptomatic therapies at home. 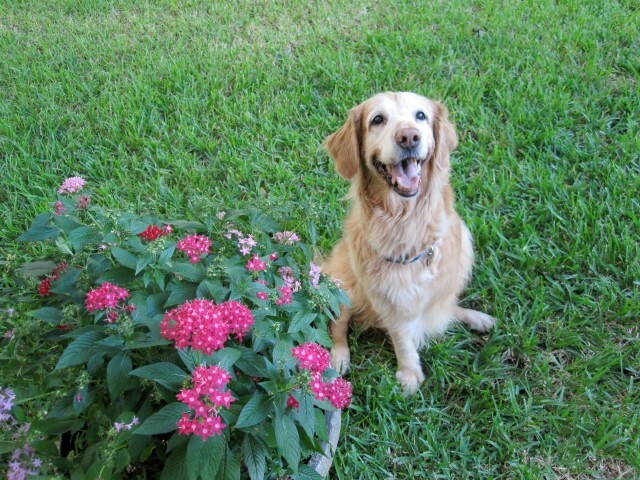 Most of your friends and family will have no idea your pet is receiving chemotherapy. Whenever possible we use Vascular Access Ports (VAPs) to deliver chemotherapy which are devices commonly used in human oncology. These are metal disks placed beneath the skin with an exit tube directly into a blood vessel. The disk can stay beneath the skin for months or years if necessary. This allows animals to receive chemotherapy drugs in a more relaxed setting without having to be as restrained or have their legs shaved or catheterised. A Vascular Access Port prior to insertion beneath the skin. The metal disk has a central resin chamber through which the drugs are injected. 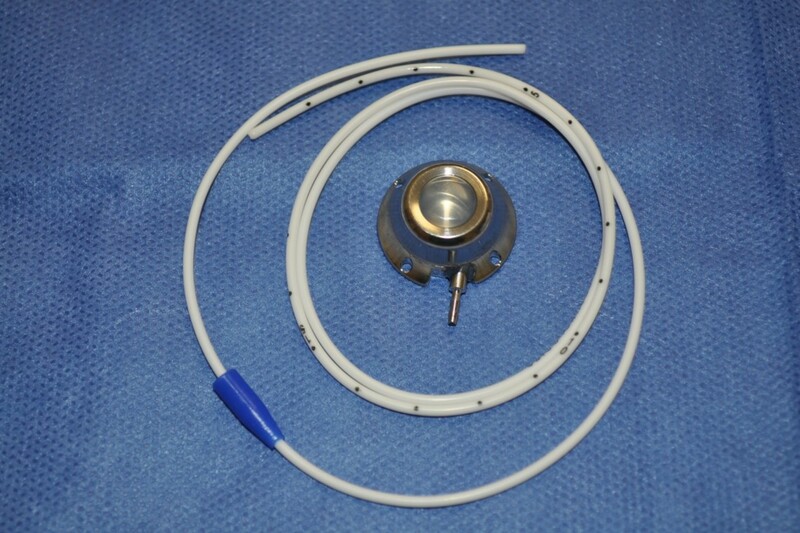 One end of the white tubing is connected to this chamber, the other end is inserted, and left, in a blood vessel. This device removes the need for constant restraint and leg injections. 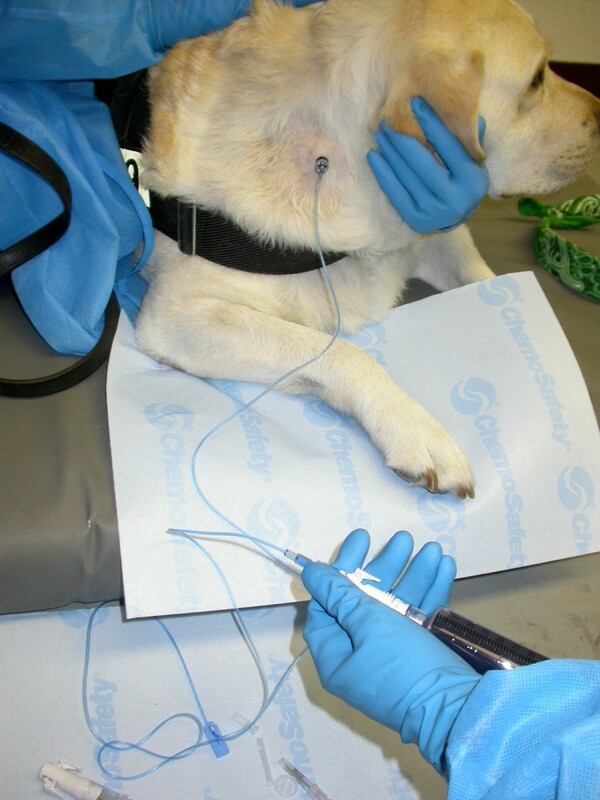 A dog receiving chemotherapy via the metal VAP inserted beneath the skin. The process is significantly less stressful and much safer for the patients. The treatment for axial OSA usually depends on the location of the tumour. Some of the same options exist as above for axial OSA, for instance home care, bisphosphonates, radiation, and surgery. Surgery for axial OSA might involve removing the affected rib, or part of the jaw, or even part of the pelvis. These are procedures our surgical oncologists are very familiar with and will be able to show you many photos and videos of previous cases to familiarise you with how (well) pets function after these surgeries, and what cosmetic changes you might expect to see, if any. What is the prognosis of OSA? 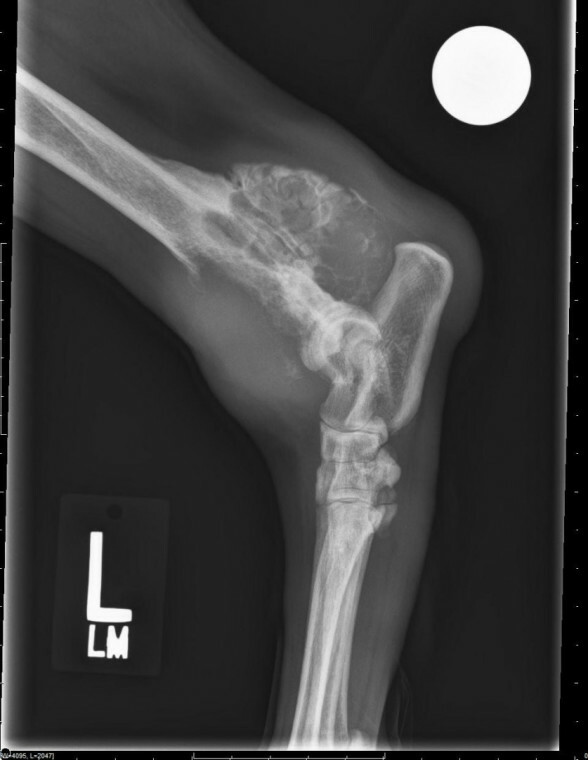 Despite all our best efforts, dogs with appendicular (long bone) OSA will almost certainly be lost to the disease, either from the primary tumour (the bone) causing uncontrollable pain, or the secondary tumours (the metastases) affecting the quality of life of the dog. The commonest site of spread is the lungs, and advanced disease here most commonly causes weight loss and weakness (cachexia), not breathing problems as you might expect. Median survival times have been reported for the following therapies. It is important to realise these numbers are averages – half the patients will do better than these figures, but half unfortunately will do worse. The outcome of OSA can be improved if early diagnosis and treatment is achieved. One of the most important goals to treatment is to remove pain from your pet and ensure their quality of life is the best it can possibly be.